I’ve been a huge fan of MIT Professor Walter Lewin for some time. My first introduction was when I took his course 8.02 on Electricity & Magnetism with MIT Open Courseware, the delightful experience for free and open learning. I took Lewin’s course quite seriously because it helped me in my metamorphosis toward astrophysics since my college physics coursework was many decades stale. I dutifully bought the textbooks and downloaded lectures onto my iPod so I could learn pretty much anywhere I might find myself. Dr. Lewin’s lectures were energizing, filled with insight and unbridled enthusiasm for the subject. I knew I had stumbled onto a superstar. 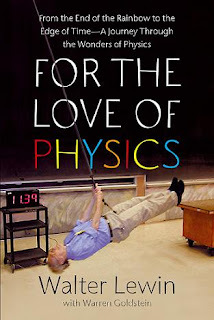 When I learned he wrote a book on his favorite subject - physics, I just had to write a review of “For the Love of Physics” (Free Press, 2011). Written with Professor Warren Goldstein, the book weaves in stories from his own life, including the impact of the Holocaust on his family and his life, his coming of age as a physicist, joining one of the most dynamic groups of astronomical explorers and making an exciting series of major discoveries in x-ray astronomy. Lewin describes the awe-inspiring feeling of being a young scientist in the dawn of the nuclear age and holding exotic radioactive isotopes decaying in his hands. He takes intimidation out of the physics equation by focusing first on the wonder of our everyday lives – such as the mysteries of why lightning strikes and how musical harmony works – and in introducing some of the most awesome features of the outer reaches of the universe, he makes the astonishing workings of phenomena such as supernova explosions remarkably clear. 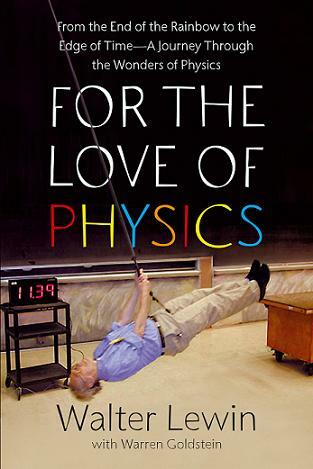 As with his online lectures, Lewin’s infectious energy and passion, for both physics and teaching, jump off of every page, making the elements of physics comprehensible even for those who might have feared physics in high school or college. He allows us to see the world all around us with new eyes, and to peer into the far reaches of the universe, from showing us how to hold a rainbow in our hands to illuminating the mysteries of black holes. I can highly recommend this book as a perfect gem for engaging the wonders of nature. I know it will gain a permanent place in your science library.